Since the collapse of the Soviet Union in December 1991, scores of US based and international Christian mission agencies have sent thousands of short-term volunteers to Russia . The underlying rationale for these and other efforts has been multifaceted: to meet spiritual and physical needs of the people, to develop and strengthen local churches, and to promote peace and understanding. However, long-term results have been meager due to language and cultural differences. Subsequent growth is coming from a new generation of indigenous evangelical movements - such as Russian Missions. Since 1993, Russian Missions has participated in evangelistic efforts in over 500 locations throughout Russia (i.e. cities, towns, streets, country-side stopovers, apartment complexes, prisons, etc.) and can unequivocally state that it has reached almost one million people-nearly all of whom have expressed the desire to learn more about God. Since the age of 16, Pastor Sasha has involved himself in evangelic work both in the former Soviet Union and the United States . Since 1978, he has participated in hundreds of evangelical outreaches throughout the former Soviet Union and continues to do so. At present, he ministers with Russian Missions and is senior pastor of a large bi-lingual congregation in the United States. Rev. 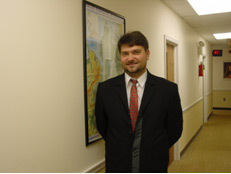 Yuchkovski holds three master's degrees (Business, Theology and Engineering) and is presently working on his doctorate degree in Oxford, England. Yevgen has been associated in Russian Missions since 1996. He has partnered with Rev. Yuchkovski in 100's of outreaches. This partnership is advantageous as it addresses Christian ethnics as well as politically important issues in a laid-back manner and is especially amenable to youths. Yevgen is a gifted musician who fulfills God's calling through his inspirational music and through his strong testimony. After years of turmoil with alcohol and drug additions, he became a believer in 1990. Today, Yevgen is a well-know Russian musician and an honored Russian Missions evangelist. He is always well received by Russian audiences (young and old). He has written and produced over 90 songs and recorded and produced eight CD's. Yevgen has been highly praised with several songs reaching the top record listing in Russia . His musical subject matter encompasses societal topics such as abortion, prostitution, orphans, Chechnya, etc. 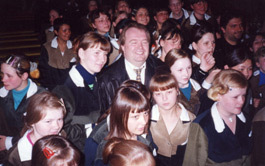 In 2003 he traveled to the United States for the first time and staged musical performances in Russian churches in California and eastern states. He was so well received by the American audience that Russian Missions is working on future projects with him.